NFL: Are the Cincinnati Bengals Facing a Quarterback Controversy? 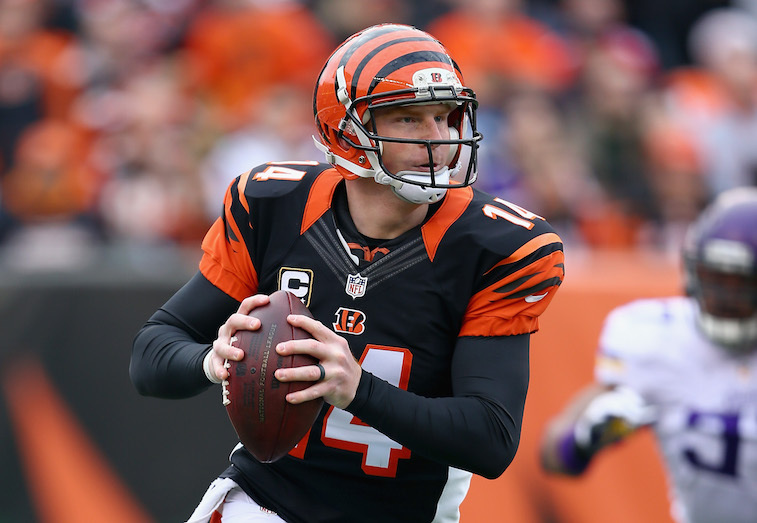 Make no mistake about it, Andy Dalton is the Cincinnati Bengals starting quarterback. That’s why the team inked the 27-year-old signal caller to a six-year, $96 million contract extension shortly before the 2014 NFL season kicked off. With that being said, it would be completely foolish and wildly naïve to even suggest the idea that the Bengals are completely sold on Dalton as their long-term solution at the most important position on the field. The former TCU Horned Frog has flashed signs of brilliance since entering the league in 2011, but at the same time, he has at times looked like he has no business playing quarterback at the NFL level. In his defense though, Dalton has led the Bengals to the AFC Playoffs in each of his four years as the team’s starting quarterback. That’s where the positivity ends. By no means are those bad numbers, but do they jump off the page as franchise quarterback-esque numbers? Absolutely not. As you can see, Dalton has been at his worst on the game’s biggest stage. In total, Dalton has played in 14 prime time and playoff games. His record in said 14 games is 3-11, his quarterback rating is 70.0, his completion percentage is 55-percent, and he has thrown a total 17 touchdowns and 12 interceptions. Despite the fact that the total value of Dalton’s contract is eye-opening, the team could move on from their 2011 second round pick with minimal financial damage. And it just so happens that there is another young quarterback on their roster who is emerging during Organized Team Activities (OTAs) that may have what it takes to legitimately challenge Dalton for the team’s starting quarterback job. The quarterback in question is second-year pro AJ McCarron, who was the team’s fifth round pick in the 2014 NFL Draft. For those who don’t remember, McCarron was a three-year starter for Nick Saban at Alabama, and in addition to re-writing their passing record book, he also led the Crimson Tide to two BCS national titles. It was somewhat surprising to see McCarron slip to the fifth round of the Draft, but as it turns out, the 24-year-old was battling a shoulder injury throughout the pre-draft process. The injury was ultimately severe enough to put an end to McCarron’s rookie season in Cincinnati before it ever really got started. 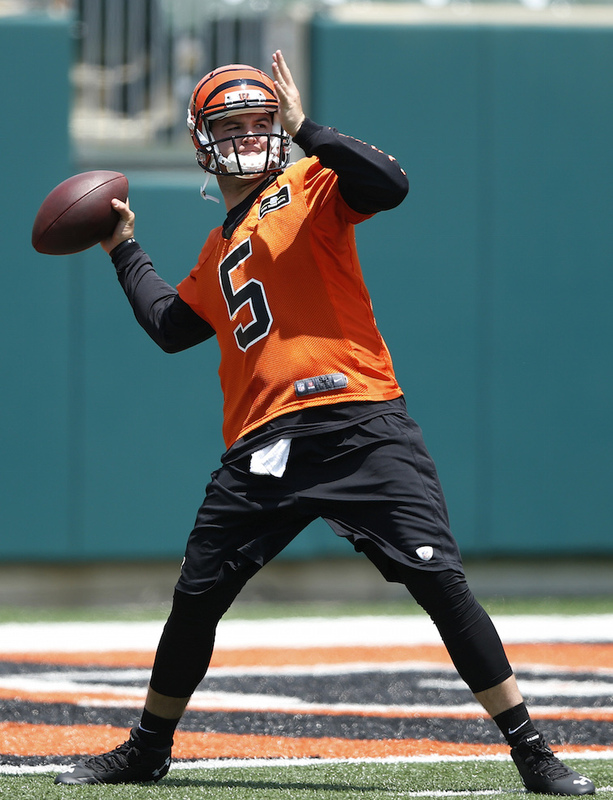 According to reports out of Bengals OTAs, McCarron’s shoulder is fully recovered and the Mobile, Alabama native looks poised to push Dalton for the team’s starting quarterback job. It is painfully clear that McCarron possesses the confidence that is necessary to play quarterback at the NFL level. On top of that, he proved during his time at Alabama that he can excel on the game’s biggest stage – something Dalton has yet to achieve. Nonetheless, it remains highly unlikely that McCarran unseats Dalton as the Bengals’ starter in 2015. However, by turning in a strong offseason and playing well during the team’s preseason games, he can force the Bengals into making a tough decision or possibly force them into letting him openly compete with Dalton for the job next offseason. Only time will tell how this situation plays out, but it appears as though the Bengals may have found a viable alternative to Andy Dalton should he struggle with his consistency again in 2015.